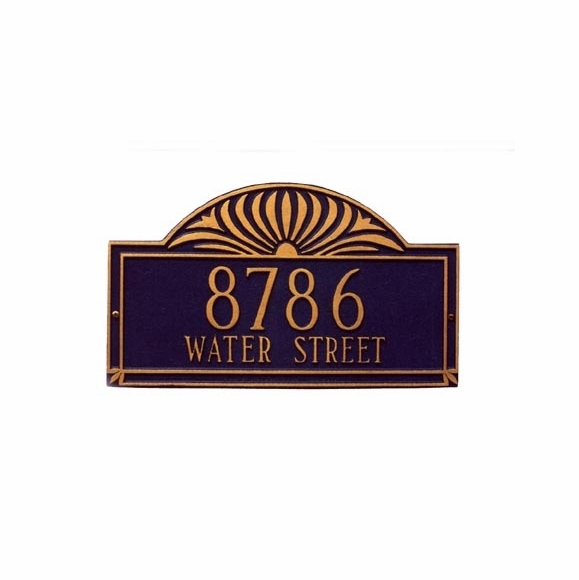 Whitehall 2104 Sunburst 16.25 x 9.5 Lawn Marker announces your street name and house number with two lines of text. Line 1 holds up to five (5) 3" characters. Line 2 holds up to seventeen (17) 1.25" characters. Comes with one lawn stake. Crafted from rust-free recycled aluminum. Paints have been specially formulated and weather tested to withstand the harshest elements. Made for you in the USA. Delivery time: please allow 2-3 weeks for delivery.